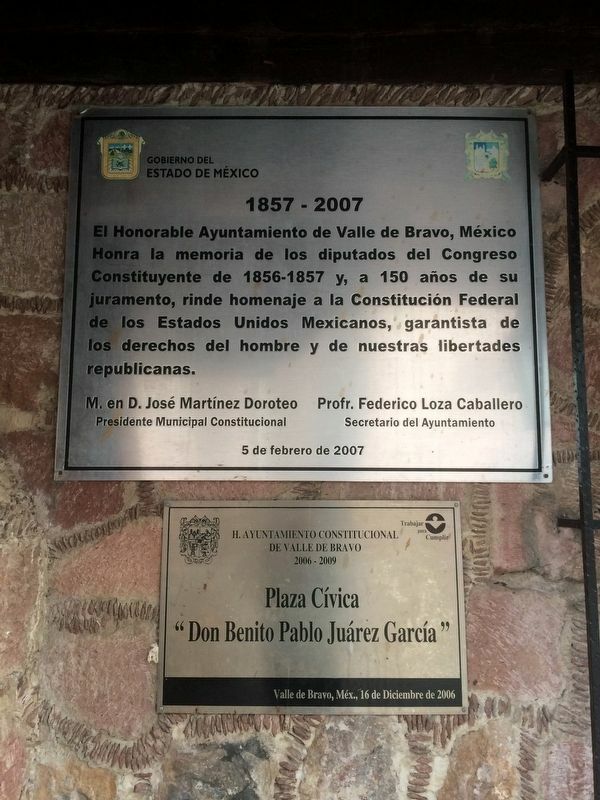 Honra la memoria de los diputados del Congreso Constituyente de 1856-1857 y, a 150 años de su juramento, rinde homenaje a la Constitución Federal de los Estados Unidos Mexicanos, garantista de los derechos del hombre y de nuestras libertades republicanas. Honors the memory of the deptuies to the Constituent Congress of 1856-1857 and, 150 years since their oath, pays tribute to the Federal Constitution of the United Mexican States, guardian of the rights of the people and of our republican liberties. 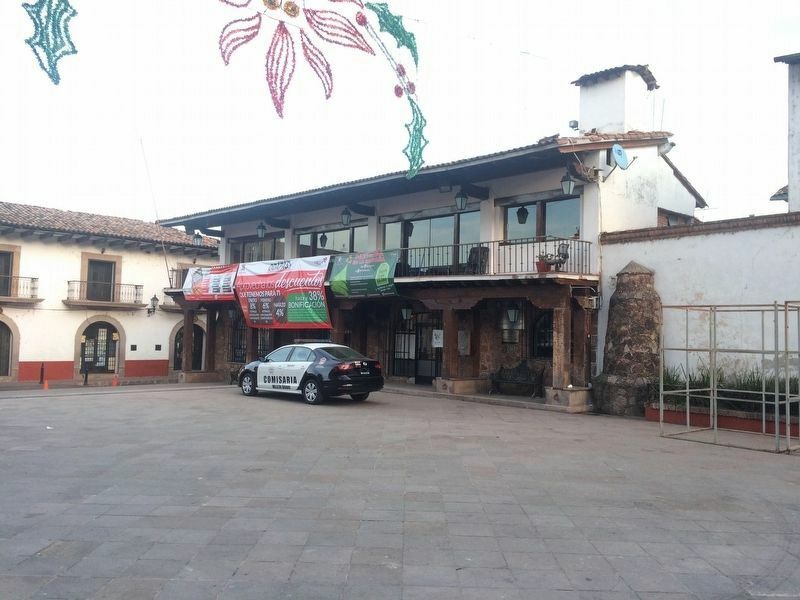 The marker is to the right of the entrance to the police station in the Valle de Bravo municipal building. Erected 2007 by Honorable Ayuntamiento de Valle de Bravo. Location. 19° 11.66′ N, 100° 7.892′ W. Marker is in Valle de Bravo, Estado de Mexico, in Municipality of Valle de Bravo. Marker can be reached from Calle 5 de Febrero just south of Calle Porfirio Díaz, on the left when traveling south. Touch for map. Marker is in this post office area: Valle de Bravo, Estado de Mexico 51200, Mexico. Touch for directions. Other nearby markers. At least 8 other markers are within walking distance of this marker. The Name of Valle de Bravo (here, next to this marker); Nicolás Bravo (within shouting distance of this marker); Valle de Bravo in the Mexican-American War (within shouting distance of this marker); Pedro Velázquez H. (within shouting distance of this marker); Villagrán Street (about 90 meters away, measured in a direct line); José Castillo y Piña (about 90 meters away); Juan de Jesús Herrera y Piña (about 90 meters away); Coliseum Street (about 120 meters away). Touch for a list and map of all markers in Valle de Bravo. More about this marker. The marker is a few steps to the right of the entrance to the Valle de Bravo central police station, on the first floor of the municipal building. Regarding The Mexican Constitution of 1857. 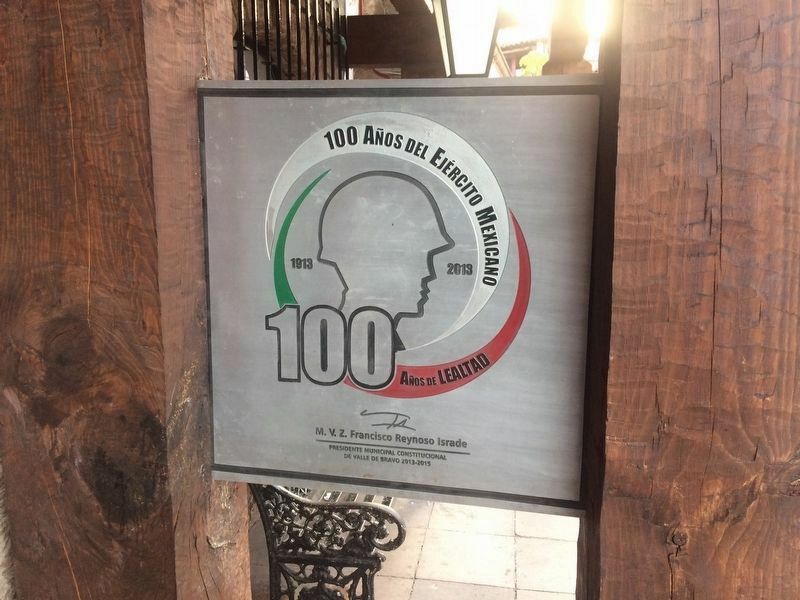 This additional marker is interesting in that it takes the creation of the Mexican Army from the Mexican Revolution in 1913, probably as a way to differentiate it from the post-independence armies that were allied with different individual leaders or factions. The 1857 Mexican Constitution was considered a liberal document, guaranteeing the rights of speech and of the press, the right to assembly and the right to bear arms. It also curbed the power of the Catholic church, causing deep differences of opinion with Conservatives. The result of the 1857 Constitution was the Reform War, a three-year civil war which, although eventually won by the Liberals, was soon overthrown by Conservatives as they installed Maximilian as their monarch during the Second French Intervention period. More. Search the internet for The Mexican Constitution of 1857. Credits. This page was last revised on February 3, 2018. This page originally submitted on February 3, 2018, by J. Makali Bruton of Querétaro, Mexico. This page has been viewed 70 times since then and 7 times this year. Photos: 1, 2, 3. submitted on February 3, 2018, by J. Makali Bruton of Querétaro, Mexico.